I tried painting acrylic before, but it just didn’t look right (not without a bunch of work). But I got tipped off on an easier method from the Shopping Sherpa when she painted her powder blue Panton chair black. SS mentioned using spray paint specifically for plastic, by Tamiya which is widely used by RC hobbyists. Sounds obvious when you think of it, right? So after browsing the hardware store, I found something similar in the Krylon Fusion spray paints. 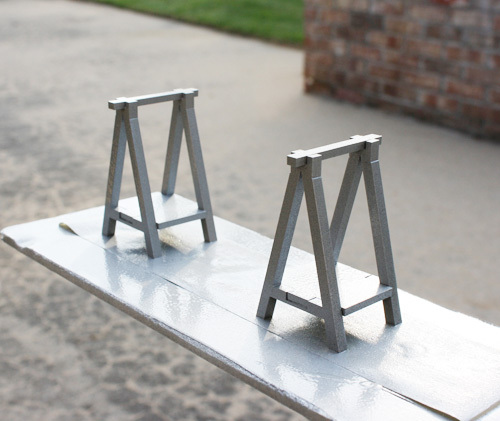 My test subject was the black VIKAesque desk legs and the Silver Hammer Finish Krylon Fusion spraypaint. This is the end result and I loves it. Since the surface area is so much smaller than what the paint is created for, there is only a hint of the hammer finish. I am perfectly fine with that and expected it somewhat. I’m going to paint a few more things silver. Also, if you are wondering, Krylon does have Fusion paints in flat, glossy, and shimmer finish. I’ve experimented with all of them and can positively say that they all look great. Above is the white glossy fusion on the black acrylic XCurve Table. All it took was two coats for the white to cover the black. 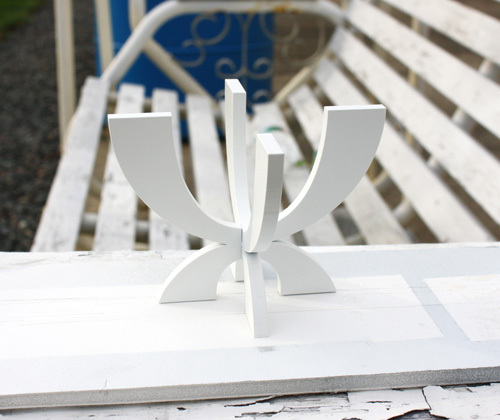 I recommend using Krylon Fusion spray paints it if you want a quick and easy way to paint plastic. Edit: I forgot to add – Don’t buy the spray paint at the craft stores. They cost twice as much as hardware store prices. Head to Lowe’s, Home Depot, Etc and grab a can for $4 bucks instead! Also, edited to add in some updated info. I’ve never thought to use that on mini’s, but James has used it several times to redo kid things. Fabulous! Woooooo can’t wait to see it!!!! And yes, do use the Krylon Fusion on minis.. it’s a quick and easy way to make them look great! Indeed! That’s why I love using them. Work smarter, not harder, I say! Ooooo, I see. I asked the hardware store people and they told me that it’s probably not available in the US, probably thinking that it’s an Aussie brand of paints. I see how it can cost more, they target hobbyists. I do still want to look into them though… thanks for the link! Looks like there is one VERY close to home…. nice! I’ve tried out Tamiya spray paint on doll furniture in the past & didn’t have much luck (but that might just be because i’m totally inept!) but I have heard that Krylon Fusion works even better – I’ve been meaning to try Krylon Fusion myself, but it’s not easy to find in the UK. The stuff you sprayed looks like it turned out really well! I wonder, do they require priming? Or is it just spray and go? 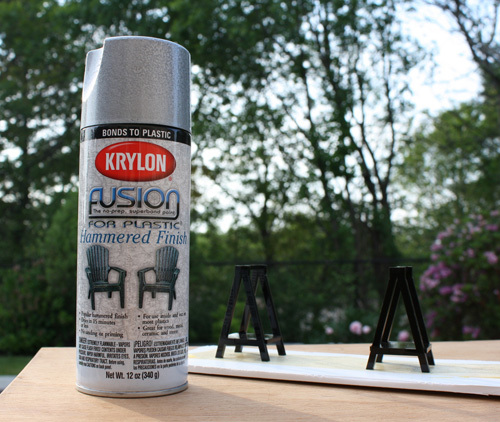 I like the Krylon Fusion because it is literally ready to spray and it looks great on wood too! Hope you’re able to find it in the UK soon. It’s great to work with! This is perfect! I just bought an antique-style kitchen table kit, and I was wondering how to paint it. The paintbrush really doesn’t work all that well. 🙂 Thanks so much for sharing! My only complaint is that the costs can add up after going crazy spray painting! Hi! I know this is an old post so I hope you receive it. I use Krylon a lot and the instructions say that when finished painting turn can upside down and spray to remove excess paint to avoid clogging up. Well I thought this was a waste of paint so my tip is to give initial spray right side up then finish job spraying upside down. This get the job done without wasting any paint.